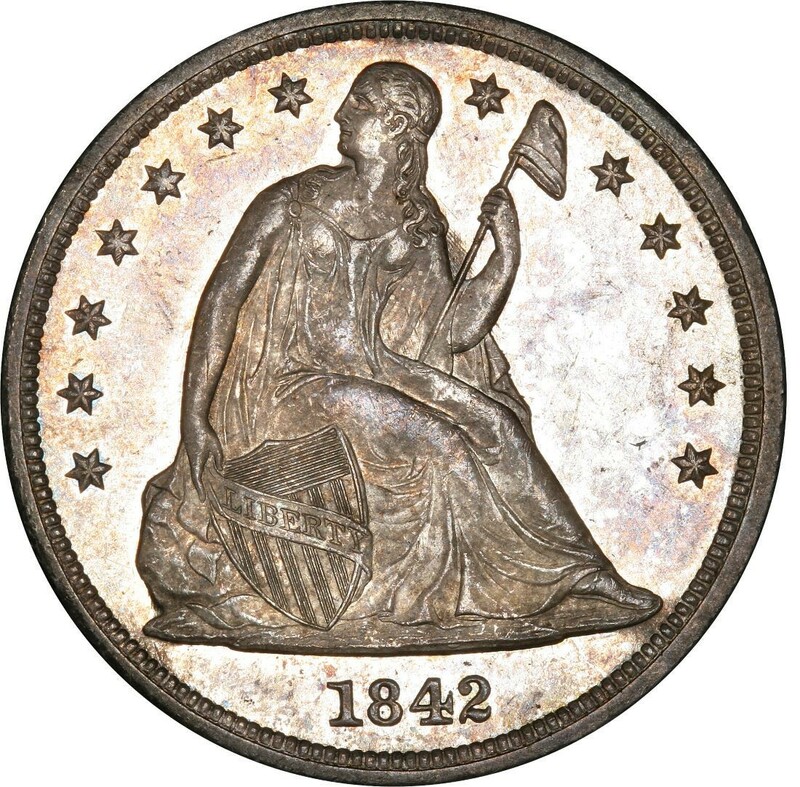 1842 Liberty Seated dollars are large silver coins that are most often sought by type collectors. Liberty Seated silver dollars are as large and hefty as the popular Morgan and Peace silver dollars and contain nearly a full ounce of silver. However, Liberty Seated dollars are far more valued for their numismatic merit than merely as a silver bullion coin. They were designed by noted United States Mint engraver Christian Gobrecht, who designed other coins featuring the Liberty seated motif shared on the obverses of other silver coins from the era. Seated Liberty silver dollars were issued by the Philadelphia, New Orleans, Carson City, and San Francisco Mints from 1840 through 1873, though in 1842 they were made only at the Philadelphia Mint. 184,618 pieces were struck in 1842, but most have long since disappeared and thus the coin is much scarcer today than mintage figures might indicate. 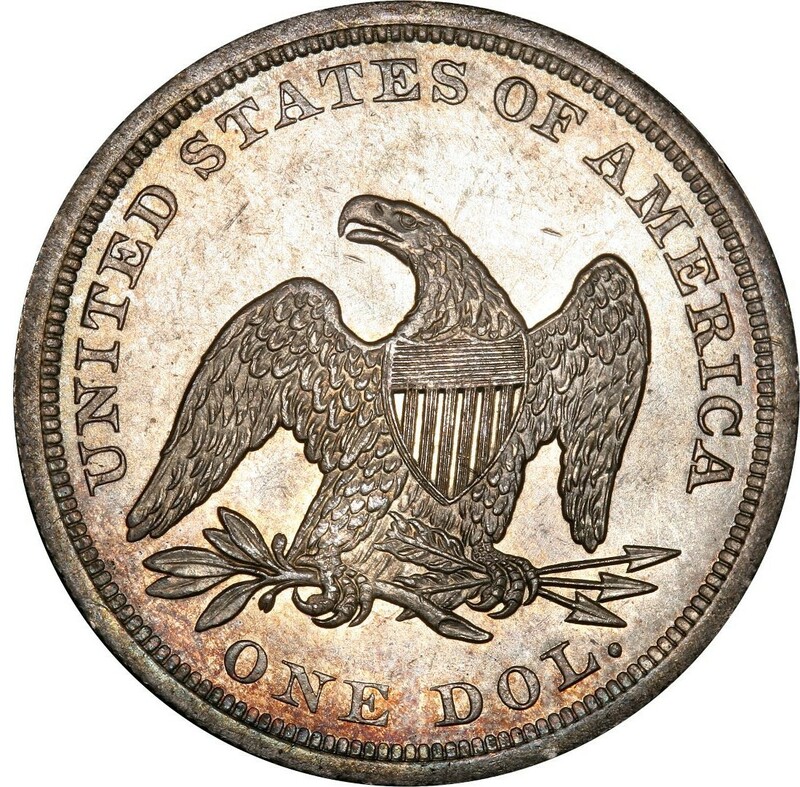 The value of an 1842 Liberty Seated silver dollar ranges from about $300 in a grade of Very Good-8 to $2,500 or more in uncirculated condition. Proofs cost $45,000 and up. Wholly original Liberty Seated dollars are very scarce. While Liberty Seated dollars were used throughout the United States when they were first issued, their use declined as silver bullion values increased in the late 1850s, and the coin soon saw its most prominent use in foreign trade. 1842 Liberty Seated dollars are made from a metallic composition consisting of 90 percent silver and 10 percent copper. The coins weigh 26.73 grams and contain 0.77344 ounces of pure silver. They also measure 38.1 millimeters wide, which is the same width as all standard U.S. silver dollars made since the mid 19th century. 1842 Seated Liberty Dollar NGC AU 55 ** Highly Demanded, Price Guide $1525! 1842 Seated Liberty Dollar XF45 PCGS.